Kings Wharf is where most cruise ships dock in Bermuda. This is the original pier or the berth in Royal Naval Dockyard. Most cruise lines show the destination in Bermuda as Kings Wharf in their cruise schedules, and therefore many visitors tend to think that Kings Wharf is the cruise port. Actually it is only a berth in the port and the port itself is known as Royal Naval Dockyard, or simply as Dockyard, and is the largest port in the island. The dockyard is located at the western tip of Bermuda in Sandy's Parish at Ireland Island (North). A second berth known as Heritage Wharf was added to the dockyard in May 2009 right next to Kings Wharf. So two large cruise ships can now dock at the port at the same time and on a line. 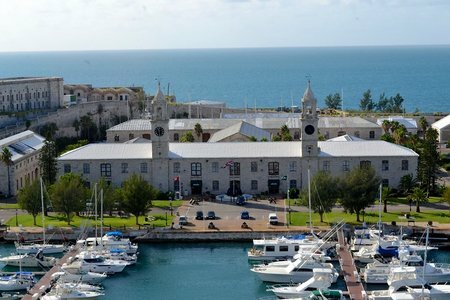 Due to large influx of tourists arriving by regularly scheduled cruises, the dockyard has developed into a modern tourist complex with many tourist attractions including National Museum of Bermuda, a manmade beach, art & craft center, several restaurants & pubs, shopping mall with boutique shops etc. A host of activities are also available at the dockyard including island & boat tours, all kinds of water sports, golfing & fishing tours, festivals etc. You can book tours right at the dockyard. Once you get off the cruise ship, the distance to the landward end of the pier (known as North Arm) would be about 200 yards. From here the bus stop or the ferry dock is about 75 yards. All attractions in the dockyard are within distances of 250 to 500 yards or so. For example the Snorkel Park & Beach is about 5minute walk from the cruise pier and Clocktower Mall is 6-7 minutes. The dockyard has three Visitors Information Centers to assist the tourists with free maps, brochures, bus schedule, tour information etc and also selling bus & ferry passes and tokens to get around the island. The dockyard is well connected with the rest of the island by bus, ferry and taxi services. There is a ferry dock within 3-4 minute walk from the cruise berths. A direct ferry (Blue route) connects to Hamilton City (the capital of Bermuda) and another one (Orange route) with St. George's (the historic town and a UNESCO world heritage site) through scenic water routes. Two regular bus routes operate between the dockyard and Hamilton. The bus route #7 goes along the famous south shore beaches offering scenic views of the coastline and the pink beaches, while bus #8 is great to view the island landscapes. And there are ample metered taxis to take you to any place in the island or even for island tours on fixed hourly rate. Scooter rentals are quite popular in Bermuda and you can rent scooters or mopeds at the dockyard itself. There are no car rentals allowed in Bermuda, however recently minicars have been introduced which can be rented for a day or longer by all including cruise passengers (online booking required). If you are visiting Kings Wharf/Bermuda, take a look into the Bermuda eBooks to make a great vacation plan in Bermuda and know about the best attractions, guided & self-guided tours, water sport & other activities, great dining & shopping options, vacation tips and lot more. The Dockyard once served as an outpost for the British Royal Navy, and has come a long way to become the busiest passenger ship port in the island. After the British lost the American War of Independence, they also lost all their ports along America’s Atlantic coastline. So as an alternative, they began construction of Royal Naval Dockyard along with its Kings Wharf pier in 1809. To build this Dockyard, the British had engaged thousands of convicts who they brought in from England and also involved many slaves from the island to work. Many workers died out of yellow fever epidemic that once ravaged the island and also due to the nature of risk involved in the work. Since its construction, the Kings Wharf and the dockyard operated for over 100 years serving the British forces in such affairs like the American War of 1812. The naval base remained in operation through the World War-II as well. However over time the British began to realize that the dockyard was no longer a real necessity as a navy port for defense. After all, the Americans became allies to the British in both the World Wars. So gradually the importance of the dockyard as a naval base started to diminish. Most of the navy facilities were closed down by 1951. Limited facilities were kept open to support British & NATO ships. Finally all navy operations came to a complete closure in 1995. Passenger cruise ships then started to visit Bermuda and docked at the Kings Wharf, and the dockyard gradually became a commercial port and a complex with many tourist attractions. Today the dockyard handles well over 350,000 cruise passengers annually, and the number is growing. You can not expect much difference in weather conditions across a tiny 21 square mile island. Weather remains mostly same all across Bermuda and is sub-tropical in nature. However there could be occasions when it rains in St. Georges (at the eastern end) while it is dry in dockyard at the west. From April until November (summer to fall) the average temperatures vary between 75ºF (22ºC) to about 85ºF (29ºC). Humidity during May to October can go well over 80 percent and it can be quite hot and sultry during the day time. Temperature during the winter (December through March) varies between 62ºF (17ºC) to about 70ºF (21ºC). You will need to wear a light jacket during early mornings and evenings during winter. Otherwise the day time is quite pleasantly cool. Check out Bermuda Weather for more information on Bermuda weather and climate. Following are the cruises to Kings and Heritage Wharf making recurring calls (several other cruises are also scheduled to visit Bermuda, however they won't make regular calls). The links below will take you to my detailed reviews of the cruises. For current schedules of the cruises to Bermuda, visit Current Cruise Schedules. The Dockyard Map will give you a good idea about location & layout of the dockyard complex along with important landmarks like the cruise piers (i.e. Kings Wharf and Heritage Wharf), National Museum of Bermuda, Clocktower Mall, Visitors Information Centers etc. The dockyard is located at Ireland Island (North) in Sandys Parish at the western end of Bermuda. If you are entering the dockyard by road, the entrance is at Pender Road with two large stone pillars at the gate. 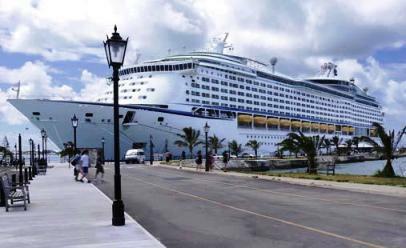 Other than being just a cruise port, Royal Naval Dockyard has developed into a large complex with many tourist attractions, restaurants, bars, activities, facilities and other commercial establishments. In fact you can easily keep a day to explore the dockyard and its many offerings. If you are cruise passenger and on your day of departure when you do not want to stray too far and risk being getting back late, you can actually plan your time in the dockyard itself. It works out nicely if the cruise ship leaves in the second half. Go through Knowing & Exploring Dockyard to find out how the entire port area (i.e. Royal Naval Dockyard) is laid out and where will you find what. There are several great beaches that are close to Kings wharf. Snorkel Park Beach is located within the dockyard itself and only few minutes walk from the cruise berths. However it is part of a commercial complex and has an admission fee. Others including the famous pink south shore beaches like Horseshoe bay beach, Church Bay Beach, Warwick Long Bay Beach etc can be reached easily by public bus (#7), taxis or scooter. Beach shuttle minibuses are also available at dockyard making several round trips during the day. Nice beaches like Black Bay, Daniel's Head are located in the same parish. There is also a lovely Sea Glass beach nearby which is full of colorful sea glasses. Here are all the Beaches near Kings Wharf. Within easy distance and accessible by bus are lovely attractions like Fort Scaur - a historic British fort, Gibbs Hill Lighthouse - the oldest cast iron lighthouse in the world, Heydon Trust - a lovely parkland with a tiny chapel, Somerset Bridge - the smallest drawbridge in the world etc. Read: Great attractions in and around Kings Wharf for full information. The Bermuda Tourism Authority and WEDCO jointly organize several recurring events & entertainment at the dockyard (mostly during summer when the cruise ships are in port). These events include cultural programs, live music, historical re-enactments, shows, art & craft etc. While there are several day-time programs during the week, many musical performances and fun parties are held in the evenings running until late night and offering nice nightlife options here. Entry to several events are free while others have entry fees. Check out Dockyard Events for current schedule of events. Other activities in dockyard includes boat tours, snorkeling cruises to outer reefs & shipwrecks, water sports like jet ski, kayaking, windsurfing, boating & sailing etc, beach activities, cycling, fishing tours, and even a fun 18-hole mini golf. An indoor Trampoline Park has opened in the dockyard which adds to the attractions for kids & families... it's located behind the Clocktower Mall. Check out Things to do at Kings Wharf to know about all the recreational and sport activities that operate out of the dockyard and the surrounding areas. 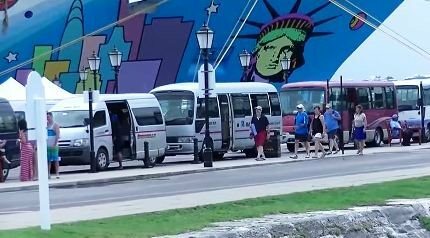 Shore excursions and boat tours offered by cruise lines are usually far more expensive than similar tours offered by the island operators most of who operate out of the Kings Wharf dockyard itself or from a nearby location. This is mainly because the cruise lines offer such tours through the same island operators and keep hefty margins or commissions on them. If you like to book one of such island tours and activities using world's #1 online service (Viator) at a low price, then look at the options below. You can find more such great tours & activities from the link given below the Top Selling tours. While there are vendors with stalls and kiosks offering different kinds of snacks at several places in the dockyard complex, there are also some great restaurants, pubs and other eateries. Frog & Onion Pub: Located inside the Old Cooperage building, this is an old British style pub and a restaurant serving pub fares and British cuisine. There is a brewery located here where you can get fresh local beers and also take tour to experience the brewing process. Bonefish Bar & Grill: They serve nice seafood and grilled items. The outdoor patio has a wonderful view of the Great Sound water area. Cafe Amici: An Italian restaurant located at the corner of the Clock Tower Mall. It has a nice relaxing and friendly atmosphere, and serves authentic traditional Italian food all seven days a week, including breakfast, lunch and dinner. Anchor Restaurant, Bar & Lounge: A relatively new restaurant serving seafood & contemporary dishes. The breakfast and Sunday brunch are great, although they serve nice lunch and dinner too. Pirate ship floating bar: Inaugurated in June 2014, this is a pirate ship themed floating bar at the dockyard located by the cruise terminal. Nice cheap drinks, good music and DJ, lovely view of the water & passing ships and youthful vibe are the main attractions. Dockyard Pastry Shop: Nice place to have some bakery items, sandwiches, cakes and coffee. There is an open patio with garden setting where you can sit under an umbrella and enjoy some snacks. They serve Traditional Afternoon Tea that comes with goodies and finger sandwiches. They are open daily from 9am to 5pm and serve breakfast and lunch. The eatery is located at the entrance of Victualling Yard in dockyard. You enter through a small moongate like arch and then you are at the patio where tables are laid out under umbrellas. There is also inside dining upstairs. #12, Dockyard Terrace. Alex & Pete's Bermuda Artisan Ice Cream: Opened in November 2016 (where Bermyberry used to be), father (Peter) and son (Alex) run this outlet offering locally made ice creams, sorbets, frozen yogurts, ice cream sandwiches, coffee of different types etc. It's a glass covered gazebo located opposite to Dockyard Pastry Shop on the main road (i.e. Dockyard Terrace) and close to Visitors Information Center. It's a few minutes walk from cruise pier and easy to find. They have their kitchen at St. George's where they have been making ice creams for many years. Now they decided to expand their outlet at the dockyard to showcase handcrafted ice creams, yogurts, sherbets etc. Some of the nice flavors in ice creams includes the old favorite of Bermudians like the chocolate ripple, pineapple sherbet, Bermuda rum flavors etc. Clocktower Mall: It's a charming covered shopping arcade located within the dockyard complex and 5-minute walk from the cruise piers. It has 100-ft high twin clock towers and hence the name. There are several nice boutique and branch retail stores in the mall. You will find attractive items like porcelain, fine china & crystals, silverware and fine tableware, dress materials for men & women, jackets & shoes, Scottish woolen goods and lot more. You can buy local handicrafts from the Bermuda Craft Market located within the dockyard in the Old Cooperage, between Dockyard Terrace and Maritime Lane. You can find Bermuda cedar-work, candles, jewelry, pottery items, straw bags, banana dolls and many other crafts here. Jon Faulkner Gallery has local & international artisans who create handcrafted pottery items like plaques and table top items. Another great place to visit is the Dockyard Glassworks where the flame artists create magnificent glass items like vases, models of animals & birds etc using glass blowing technique. Read: Shopping in Bermuda for a complete shopping experience in the island. When cruise ships are in port, a train trolley (that moves on wheels) goes around the dockyard starting near the cruise terminals and passing by the important places completing a full circuit. It makes frequent trips during the whole day. This is a free transport available inside the dockyard complex and you can hop on and off at various points. There is also a train trolley tour of the dockyard and nearby areas which is chargeable. Bus #7 and #8 operate between Hamilton City and the Dockyard. There are two public bus stops at the dockyard. One near the National Museum and the other in front of the Clocktower Mall. Bus #8 is more frequent and takes the Middle Road in Sandys, while bus#7 takes the more picturesque South Road that offers great views of the south shore beaches. Bus ride from dockyard up to Hamilton City takes about one hour and to south shore beaches like Horseshoe Bay Beach in Southampton takes about 35 minutes. Read: Bermuda Bus Services for all the bus routes, schedules and lot more information. Read: Bus Ferry Fares to get complete knowledge of how fares in buses and ferries work, the different types of fares including transport pass, tickets, tokens and cash. Check out Bermuda Ferry for the routes and schedules. There is no Car Rental in Bermuda in order to prevent congestion and pollution in this small island. But ample private taxis are available. There are taxi stands in the dockyard and taxis are readily available there. While you can take a taxi for point to point transfer, taxis in Bermuda also offer customized island tours at hourly rate. There are some taxis which have Blue Flags or its insignia on the bonnet. The Blue Flag Taxi drivers are also government certified tour guides and charge same rates as others. If you are visiting Horseshoe Bay Beach from the dockyard, depending on the number of people looking for a cab, it can be much cheaper to split the cost. WEDCO (West End Development Corporation) has Transportation Coordinators located at the General Transport Area to assist visitors on such matters. Check out Bermuda Taxi Service for more information about taxi service, fares, stands etc. The company Oleander Cycles has an outlet centrally located in the dockyard. You can rent scooters and bicycles from them. They are open all 7 days a week. There are several other companies in the island and many of them would deliver the scooter at the cruise pier. Go through the following links to get complete details on Scooter and Bicycle rentals. Minicars with a capacity of two have been recently introduced in the island and you can rent one for a whole day or longer. They are a good alternative to scooter rentals, relatively safer and would suit those who can not drive a two-wheeler. But they are more expensive. Recently a charging station has been installed at the dockyard to re-charge the minicar battery (take the second left after you enter dockyard and go to the end). Read: Minicar rentals in Bermuda to know about how to rent one. NOTE: You can park both scooters and minicars overnight at the dockyard for free. Parking space is available close to the cruise piers. There are regular private minibus shuttle service between Dockyard and Horseshoe Bay Beach. One-way fare to Horseshoe bay beach is $7. Usual capacity of a minibus is 15. The service starts at 8am from dockyard and makes several round trips during the day. The last minibus from dockyard is at 3pm, while the last one returning from Horseshoe Bay Beach is at 6pm. The beach shuttles at the dockyard operate when the cruise ships are in port. The shuttle ticket booking office is located at the dockyard and is open from 8am to 2pm. They will let you known the exacts timings of the shuttles or you can inquire at a Visitors Information Center at Dockyard. Segway offers 2-wheeled battery operated self driven machines which you can rent and get around the dockyard. They are located within the dockyard and opposite to Oleander Cycles. You can see the yellow Segway bus parked at the corner. Read: Segway rentals for details. There are three Visitors Information Centers in the dockyard (now renammed as Visitors Service Centers)... One near the Kings Wharf pier, one at the end of Heritage Wharf pier and the third near the ferry dock. You will get free foldable pocket map (known as Handy Reference Map), brochures, tour guides, as well as bus & ferry passes and tokens at the centers. They are usually open on all seven days and have shorter working hours on Saturdays and Sundays unless there is a cruise ship on port. There are usually long queues at these visitors centers when a cruise ship arrives. Cruise passengers line up to get transport passes, maps, brochures etc. Note that booklet of bus/ferry tickets can be cheaper for limited rides. But you won't get them at the dockyard. This is likely because the Tourism Authority wants to promote transport passes to tourists which is costlier but offers unlimited rides in public buses and ferries. In order to get the booklet of tickets, you need to either take a bus, pay by cash in exact change and go down to the nearest post office (at Somerset), or take a ferry to Hamilton Ferry Terminal where it's available. Check out Visitors Information Centers for more details including location, timings, offerings etc. Since February 2012, the entire dockyard has been wi-fi enabled. You can connect to the wi-fi network from your laptop, phone etc and pay online through your credit card. Rate plans are available for hourly, one day, 3-day usage etc. You can connect to this wifi service from your cruise pier as well. Long distance calling cards are also available at several places within dockyard. Check out Internet Access to know about wifi services, rates and internet cafes. One Bermuda dollar is equivalent to one US$. If you are carrying US dollars, you won't need to change to Bermuda Currency. US currency is freely accepted in all shops, restaurants and outlets. A shop owner may return Bermuda currency as a change when you pay in US currency. Ensure that you use up all your Bermuda currency in the island itself, else you may not be able to convert them into your home currency when you get back. There are ATMs in the dockyard complex (one near the Clocktower Mall and another near Frog & Onion Bar & Restaurant). They dispense Bermuda currency. Visit Bermuda Currency to know all about currencies and denominations in Bermuda. A webcam has been installed in April 2013 on top of the Commissioner's House at Dockyard. As a result you can now see a live streaming video of the dockyard on your computer/laptop. You can see the cruise ships arriving and leaving, and also many activities in the dockyard as well as the surrounding area of the island. Visit www.portbermudawebcam.com to watch live streaming video of the dockyard. 1) Check out Bermuda Cruises to know about the currently scheduled cruises to Bermuda, review of the cruises, on board amenities, schedules and more. 2) Sandys Parish: Other great attractions, restaurants, hotels etc in the parish. 3) Bermuda Ports: About all the ports in Bermuda including Hamilton City & St. George. Hello! I am trying to determine the best way to travel from Kings Wharf to St George with stops along the way back to the ship. Im thinking we should take a ferry one way to St George. After exploring there, we want to take the bus back to the ship so that we can stop at different locations, such as The Swizzle Inn, Warwick Bay, Horseshoe Bay, Somerset Bridge, and maybe other places but thats the basic path Im thinking of so far. Is it best to continue on by bus to the dockyard or take the ferry from Somerset Village at that point? Also wondering if there is some type of combination bus/ferry pass. Thank you for your assistance. Hi, there is a transport pass (works for both public buses and ferries) which you can purchase at the Royal Naval Dockyard (referred as Kings Wharf by the cruise lines but it happens to be the name of the pier). You can get it right next to the pier ...expect long queues though. Somerset village is almost next to the dockyard... both are in the same parish (Sandys)... so why take a ferry from Somerset which might take you elsewhere? Take a bus from St. George... bus #10, 11, 1 or 3... all good for gulping rum swizzles at Swizzle Inn. Continue on one of these buses to get to Hamilton city (preferably #10 or 11 because the route is shorter). At Hamilton City you have two options... if the rum swizzle is too much on you by now, take the ferry (blue route) straight back to the dockyard (20 minutes), otherwise take bus #7 to Warwick Long Bay, Horseshoe Bay, Somerset Bridge etc... the same bus would take you to the dockyard... however at Somerset Bridge, you will also get bus #8 to get to the dockyard. Not sure how will you time this 'Basic Path', but if time still permits, try to visit Gibbs Hill Lighthouse near Horseshoe Bay Beach. St George to Dockyard by bus (with a transfer at Hamilton) would easily take more than two hours non-stop. Good luck! A year or two ago we visited Bermuda on the celebrity cruise ship the Summit. A small train came right to the door of the ship to take passengers to the clock tower to shop.. It seems now we have to walk to the end of the dock. Being seniors who really can't walk that distance (the cruise ship managed to get my 86 year old husband to the end of the dock we took the train.. But found ourselves stranded when we were done.. Spoke to cruise ship they suggested we contact you.. We are trying to plan our annual cruise Sept 1 of 2019 and would like to know if the service has been improved..
Hello, the authorities at Royal Naval Dockyard (WEDCO) can give you the official response. The trolley train (a free shuttle) moves through the dockyard during summer and between 8:30am to 6pm. It stops at various points within the dockyard including several attractions, shops, restaurants etc and one can hop on and off. Cruise ship passengers can board the train at the stop located at the end of North Arm (a 120-meter walkway from the cruise berths). It won't come right up to the cruise piers. Hi - Does the Fun Bus still run from St George (2018)? Is there any easier way to get to Gombeys from the Dockyard? Also - what would be the best beach for easy access for an 86 year old - short walk, soft sand and facilities? Thanks so much for your help! Hi, the direct fun bus from dockyard to St. George/St. Davids was introduced only as an experimental case and there is no such regular service.To get to Gombeys bar on Clearwater beach at St. Davids, you can take a ferry to St. George and then bus #6 (not all services reach Clearwater, so ask the driver). Snorkel Park Beach is within dockyard itself, short walk from the piers and has all facilities. There are regular services of beach shuttles (minibuses) from the dockyard to Horseshoe bay beach. The beach shuttle goes right up to the parking lot and then it's a short walk to the beach. Horseshoe has all facilities. One way fare is $7 per person. It seems Norwegian is cancelling cruise calls to Bermuda because of hurricane Florence. Hi first I want to thank you for all the details on your side. It's very helpful. I am traveling with a group of 20 to Bermuda via cruise. Since we have elderly and young kids, I am trying to plan the best way to get to horseshoe bay without chaos. I am sure everyone on the boat will be rushing to get tickets at the dockyard. I want my family to be set and not having to line up for a long time. Do you have any contacts that I can reserve the minibus ahead of time or even hire the driver for a day? Titan Express has buses with a capacity of 24 (Email: [email protected]). When renting a scooter for 24 hours, is there a place to park them if your staying on the ship? Thanks for your time. Yes, there is ample scooter parking near the cruise piers at Royal Naval Dockyard (the main cruise port). Hello! Coming into the dockyard on a cruise in July. Just wondering what the closest & best beach option would be. I don't want to be taking a few buses or other modes or transportation to get there so looking for the easiest option. I know snorkel park is right there but just wondering your suggestion. Daniel's Head? I'm into photography so definitely want a cool atmosphere aside from beautiful water. I know Jobson's Cove has cool rock/cove areas but that is a hike from dockyard, no? Thanks! Hi, there are hardly any sidewalks once you go out of the dockyard (cruise port) main gate. While Snorkel Park is located within the cruise port area itself, it's a man-made commercial beach and is not ideal for photography. Black Bay and Sea Glass beaches are about 20-minute walk from dockyard. They are small beaches. Sunset view from Black Bay is excellent. You need a transport for most other beaches. Bus stop for Jobsons Cove is about 40-minute away from dockyard by bus. Suggest you go through the page Beaches in and around dockyard. Catching a mini bus or cab was very easy. We docked at the Royal dockyard and as soon as you walk down the pier the taxi stand is there. We were a group of 19 and the transportation officers were very helpful in trying to get us in 1 minibus but they ended up having to split us into 2. The driver was friendly and informative. It was only $7pp each way to Horseshoe Beach. Definitely look forward to returning and have no concerns about catching cab or minibus instead of paying the cruise line for transportation to the beach and only get to be there 2 hours. We caught the minibus at 11am and didn't head back until 4pm. Sorry to bother you but you have a webcam at kings wharf that is brilliant, I watch it all the time BUT could someone do something about the audio or speaker that is attached to it. It is getting worse by the day, you cant make out the hooters, the bell nothing any more it is getting so bad. It cant be that hard to repair the speaker or something so that the sound is better thanks. Hi, most shuttles are 15-seaters, few have larger capacity. Shuttles line up near the cruise pier. You can pay directly to the driver or buy tickets in front of the shuttles. You mentioned in one of your transportation questions that the quickest way to obtain the 15 ticket (for bus and ferry) travel option from the Dockyard (arriving Wednesday am on the Celebrity Summit) would be for one member of my group to go to the Mangrove Post Office in Somerset and then bring the tickets back to the pier. I found the appropriate bus schedule and determined that the earliest buses to Somerset were at 8:50, 9:20, 9:50 and 10:20. I'd just like to ask (because I couldn't find a specific list of times at EACH stop in both directions) about what time a bus might depart Somerset, going back to the Dockyard. I assume it will take a good 1/2 hour for my husband to locate the Post Office - Mangrove/Somerset, purchase the tickets and find his way back to the bust stop, but want to make sure that we don't waste the whole first morning just trying to get organized. Additionally, I was wondering if you have any idea how long the lines (at the Dockyard) are to purchase the 1 day passes, as my husband was thinking of either bringing exact change for that first bus ride to Somerset vs. buying a 1 day pass, just for himself, so that the first round-trip to Somerset isn't a total waste of money. Thanks for being so patient with all of our complex tourist questions. Your patience clearly knows no bound and you are to be congratulated on helping so many strangers to enjoy Bermuda to the fullest! Hi, it takes 53 minutes (on an average) for a bus to reach Somerset from Hamilton and another 9 minutes to reach dockyard. So refer to the bus schedule (of route #7 or 8), add 53 minutes to the start time at Hamilton, and you will get the timings when the buses would be at Somerset while heading towards dockyard. Unfortunately, there is no other easier way to know. Here is another option, instead of taking a bus, your husband can take a ferry to Hamilton (paying by cash). Takes 20 minutes one way. Tickets, passes and tokens are available at Hamilton ferry terminal itself. He can then return by the next ferry. This may be easier. If he can take the first ferry at 7:30am, he can be back at the dockyard by 9am. Check the ferry schedule for all timings. Sometimes there are long queues at the Visitors Information Centers (VICs) at the dockyard, particularly when more than one cruise ships are on port. In such a case, it's better to avoid the VICs located next to the berths, and instead walk down to the one few minutes away. Chances are that this VIC would have a shorter queue. Only one-day pass is available at the dockyard. You can however pay by cash in both bus and ferry in exact change in either US or Bermuda currency (only coins). You will get all passes, tickets and tokens at Hamilton ferry or bus terminal. We are sailing in on NCL Dawn on the 10/7/16 sailing and would like to go to the aquarium and crystal caves for a day. I don't believe we will be doing any other traveling around the island so after reading all the information it would appear that purchasing tokens would be the least expensive but appears that they are not available at the dockyard. Is there anywhere close to the pier that they are available or at that point are we just better off paying cash fare? Thank you so much for your help! Pay in cash for the Hamilton ferry. At Hamilton ferry terminal you can buy tokens or even tickets for rest of your travel (up and down). Raj, My family and I will be cruising to Bermuda (Kings Wharf) next week. Some is us would like to visit Horseshoe Bay and are somewhat confused about getting there. From what we are reading, there was a shuttle from the pier but it was discontinued. Now we are reading that there is a shuttle/cab service at $7. per person each way. Can you please help us figure this out. Thank you so much. Your articles have been very helpful answering many of our questions and we are looking forward to visiting Bermuda as a family! Last year the shuttles were run by the dockyard management. This year these are private shuttles. To the cruise passengers, there is no difference. There are shuttles to the beach with one-way fare of $7 per person. You have to take a short walk away from the royal naval dockyard to reach the public bus area. There is a canopy and chairs set up for your wait, but when the driver arrived, he only took a few people saying he had to "leave room for the locals". Mini buses by the dock are the best way to get to Horseshoe Bay - $7 one-way and do like we did--explore!!! Traveled by NCL cruise ship, 1st week June 2016. The VICs in Dockyard do not sell ticket or token for the bus for 4 adults going to horseshoe bay. We were obliged to pay in cash BUT, bill is not accepted (quite crazy !!). So obliged to find 20 coins of 1 dollar. Welcome to French tourists in Bermuda. Can someone tell me from the Royal Naval Dockyard where is the closest place for me to buy the 15 ticket booklet and what bus or route to take to get to there and approximately how long. Thanks. You get bus/ferry tickets at Somerset Post Office - about 10 minutes by bus (#7 or 8). Also at Hamilton Bus/Ferry Terminal (take Blue Route Ferry - 20 minutes to Hamilton ferry). 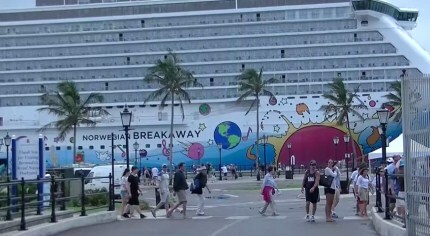 Our family will be visiting Bermuda this summer on the Norwegian Breakaway. Horseshoe Bay is on our list of places to visit. Our 10 year old daughter has special needs and uses a wheelchair. Will the mini bus from the Dockyard to Horseshoe Bay be able to accommodate her and her wheelchair- it folds up like an umbrella stroller. Also, do you know if Horseshoe Bay has a sand wheelchair available for rent once we get to the beach? Hi, usually the beach shuttles do not take wheelchairs of any kind. However you can make a request to the driver. Sometimes depending on how full the bus is and extra space availability, they may allow. Beach wheelchairs are available on rent at Horseshoe bay beach but in limited number. You should not depend on that particularly on high season. Your best option would be to take a taxi (most take folding wheelchairs in the boot). Can you please tell me exactly which buses to take and how to get from Royal Naval Dockyard to Gibbs lighthouse then to horseshoe bay beach and back to the royal naval dockyard? Thanks. Take bus #7 from Dockyard. For Gibbs Hill Lighthouse, get off at Lighthouse Road stop on South Road (about 30 minutes by bus). From there a walk for bout 220 yards along Lighthouse Road and then left into St. Anne's Road for 100 yards to reach the lighthouse. After the visit, get back to South Road. You can then walk for about a mile along South Road (towards east) or take bus #7 again. You will reach Horseshoe Road which goes downhill to Horseshoe Bay Beach (about 450 yards). From the beach you walk back up (there is also a shuttle) to the South Road bus stop. Take bus #7 for dockyard (going towards west). You will be back at the dockyard in about 35 minutes. Dear Sir, Is the paid WiFi at Royal Naval Dockyard (Kings Wharf & Heritage Wharf) able to be used in the cruise ship? Range wise? Thank you! Yes if you are closer to the cruise pier (i.e. landside). Wi-fi signal may be weak towards the water side. Take a bus and go down to Mangrove Bay Post Office (closed on weekends) or take a ferry to Hamilton ferry terminal - you can get book of tickets at both places. Buy token or pay by cash for the first time. I have a map of Bermuda that was sent to me and it says the dockyard is a WiFi hot spot. How does that work? If I have my IPad can I use it free or do I need to get a card or something to use it? Not free. You can pay online from your iPad or Laptop with your credit card and use the wifi. Hi, Once docked at King's Wharf, where can I purchase the Booklet of 15 Tickets for the ferry? In your info, it looks as if that is not available at the Visitor's Center. What would be the closest place, in proximity to the cruise ship, to make this purchase. Thank you so much! Hi, Nearest place from Kings Wharf to get bus/ferry tickets is Mangrove Bay Post Office located at Somerset, Mangrove Bay Road (8am to 5pm, Mon-Fri). Take bus #7 or 8 from the dockyard and go down to the post office (8 minutes ride), pay one way fare in exact change (Bermuda or US currency). 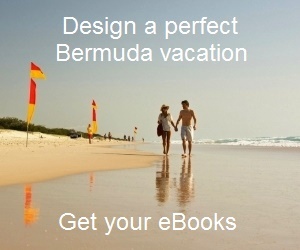 A very comprehensive, easy to find information about Bermuda and what it offers. Well done. Web site almost a secret that should not be. Been to the pub at the Dockyard and never knew it had a brew tour, dine and taste. Ditto minivans and the easy to find cost for 'Regular' service from the dockyard. One question 16.99 total trip or free to the beach and 16.00 to get back or take alternate way? (Just the way the cost is stated). Have recommended your site to several others. Thanks for your comments. $16 is the total round trip fare from the dockyard to the beach and back. Hi, yes, you will get the passes from the visitors information center located at the dockyard itself (close to the cruise ship pier). There is a ferry dock at the dockyard. You can take the Blue Line ferry for Hamilton City (20 minutes) and Orange Line ferry for St George (35 minutes). Bus #7 and 8 run between dockyard and Hamilton (takes about 1 hour). Bus #7 goes by the beautiful south shore beaches including Horseshoe Bay Beach. Can I rent a scooter near Kings Wharf? Where can I buy Coors light, or any other American domestic beer in King's Warf, Bermuda? Hi Paul, I'm not sure if you can get Coors Light in the dockyard. But you will get Budweiser, Bud Lite etc at Bonefish Bar & Grill located at the Dockyard (Kings Wharf area). A bottle costs $6.95. The Bonefish bar is located next to the dockyard ferry point. I suggest that you buy a 2-day transport pass from the visitors information center at the dockyard (right next to the pier). That will give you unlimited hop on/off access to both buses and ferries for two days. On the second day, explore some of the beautiful south shore beaches like Horseshoe bay beach, Warwick Long Bay beach, Church Bay Beach, Elbow Beach etc. The bus #7 from dockyard goes by all these beaches, and you can hop on and off. On your return, you can again take bus #7 to get back. I know the cruise ships usually sell stamps but if they dont't do you know if I can purchase stamps at the Visitor's Center? Also, are their mailboxes at port (King's Wharf) or do I need to go to a post office to mail post cards? Hi, Do all three Visitor Information Centres at Kings Wharf sell buss/ferry passes. I would think that they get very crowded when the ship lets 3000 people off at one time. Are there any other places at the Dockyard that we can pick up a pass? Can a pass be bought and sent to the U.S.? This is a great website! Thank you for your help. Hi, Passes are available at all the Visitor Information Centers (VICs). Only if you know somebody in the island, can the passes be bought in advance and sent across. There is no other way, since the passes are available & issued only in the island. Other than the VICs, there is no other place issuing passes in the dockyard. Another option is to take a bus, pay exact change and go to the nearest Post Office in Sandys to buy the passes. This is however possible during the regular office hours on week days only. Regards. Raj, its me Carole holding, Happy new year. Just read yesterday your comments about Bermuda Duty Free Shopping. I own and operated for 3 years now a large duty free shop in Dockyard at Heritage Wharf, the only shop there which services the Norwegian Cruise line and other ships who berth at Heritage Wharf pier during the cruise season!!! Though you should know... The approximate 900 sq. ft. shop also sells a large variety of my products at below normal Bermuda retail prices that are offered in all my other shops because of this duty free location. I also offer daily RUM tasting and rum cake tasting to passengers at this pier. Norwegian Dawn and Norwegian Breakaway as well as selling Duty Free liquor to passengers. The reason that the huge ships can get into the Kings Wharf and Heritage Wharf but not the Hamilton Docks is a quietly kept historical secret... under Brezhnev's rule and the days of the cold war and extreme spying (1980), a Russian submarine was spotted just off Bermuda spying on the US submarines that docked in Dockyard and St. Georges. Ronald Reagan enacted the Star Wars Project in response to Russia doing all they could to spy and access American War technology. The U.S. Government wanted their nuclear submarines to sail into Bermuda right to the dock without surfacing so satellites could not detect them. They contacted with the Bermuda and British Government and put out to tender a $1 million dollar job to dynamite and dredge the Bermuda channel and the dockyards area which my father won the contract for. It was either 1978 or 1984 I believe. The entire channel was dredged and blasted to a very deep level. It was a quietly done project. The bid my father submitted went to Virginia. That's the reason the big ships can birth there and not in other parts of Bermuda. Town Cut in St. George's was also dredged. During the dredging canons were dug up, old Bermuda bottles and British navy memorabilia were donated to the Dockyards by my father. I am coming to Bermuda (dockyard) on a cruise ship with about 80 passengers, most of them students. I would like to take them to Horseshoe Bay. Is there a bus that I can hire for this? Also, is there anyplace near the cruise ship port that this group can perform? They are a high school band.